When the Tumbleweed brewpub, which would later be named Cottonwood Brewery, opened up in the early ‘90s in Boone, only five other breweries existed in the entire state of North Carolina. Fifteen years later, however, at least seven breweries in the High Country are bottling, canning and pouring beers in Ashe, Avery and Watauga counties. To celebrate this local and legal brewing history and to “merge the old with the new,” Andy Mason, co-owner and director of brewing at Lost Province Brewing Co., invited Kinney Baughman, a legend in Boone’s craft brew scene, to help Lost Province create its 200th batch since opening in 2014. “I’ve been after [Kinney] for a long time to come down and brew with us, and I finally managed to twist his arm and get him in the brew house,” Mason joked, adding that arrangements finally fell into place about the time the 200th batch was around the corner. Baughman first came into contact with craft beer while playing basketball professionally in Belgium in the late ‘70s. When he returned to the states for graduate school at the University of Georgia in the early ‘80s, Baughman began brewing his own beer because that’s what you had to do if you wanted to drink a craft brew back then. Things would slowly but surely change. While he was away in Belgium, President Jimmy Carter essentially legalized homebrew, and then in the ‘80s and ‘90s, prohibition-era laws started changing around the country, including North Carolina, that made it financially feasible for craft brewers to sell their beer and open brewpubs. After cleaning up the place and “applying scientifically proven techniques,” Baughman said Tumbleweed went from brewing 10 gallons to 120 gallons per batch in a couple of months with only $1,000 invested into the new brewing operation. In the early ’90s, Kinney Baughman (in the background) works in the old brewery that was located in a duplex near the former Parthenon Cafe in Boone. Baughman and the brewing staff brewed the beer in a duplex near the former Parthenon Café. The duplex was located about 20 yards from the Tumbleweed Restaurant/Cottonwood Brewery and staff would carry or dolly the five-gallon kegs from there to the cooler inside the restaurant to replenish the beer reserves on tap. Educating the public about craft beer was a priority back then, too. Cottonwood Brewery always had four beers on tap: Appalachian Amber, Grandfather Gold, Black Bear Stout and a specialty/seasonal variety. “Since they were initially skeptical of craft beer in general, imagine what they thought when Baughman brewed a pumpkin-spiced ale. “The staff at Cottonwood thought I had lost my mind,” Baughman said. Cottonwood Brewery would later move to Howard Street where The Local restaurant and bar is located today before closing in Boone. Foothills Brewing Company in Winston-Salem currently brews the Cottonwood line. Just as Andy Mason at Lost Province Brewing Co. noted Baughman’s impact on the local brewing industry, Baughman reciprocated the praise. 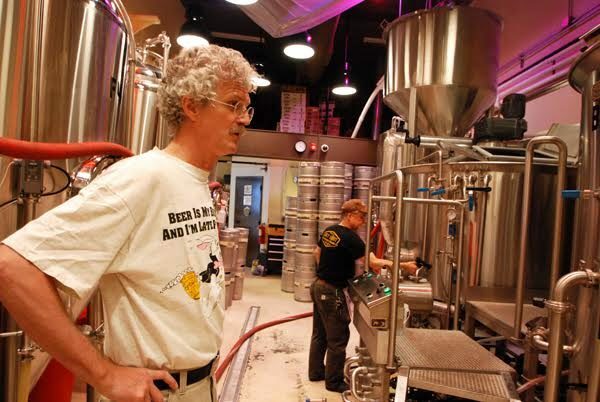 “Andy is one of the best brewers in the country for sure,” Baughman said. Mason has medaled in the American Homebrewers Association’s National Homebrew Competition, which is the world’s largest beer competition with thousands of entries. Mason has also won countless awards in other competitions as a homebrewer and now as the director of brewing at Lost Province Brewing Co., which is located on Depot Street in downtown Boone. The 200th batch of beer that Lost Province Brewing Co. brewed up a few days ago with Baughman and some of the old Cottonwood crew is the Black Bear Stout. Baughman dug up his old recipe. “I would enhance our stout recipe with black malt and chocolate malt to round out the flavors and make it a little more sweeter and what I thought was a more approachable stout beer for the masses back in the early ‘90s,” Baughman laughed. The tribute beer, which is pretty similar to the old Black Bear Stout, should be ready to drink at Lost Province Brewing Co. come mid July. Cottonwood Crew. Kinney Baughman, Brian Lee, and Craig Seaver. Cottonwood brewer Kinney Baughman with Lost Province’s Joey Edmison and Andy Mason, the latter who is co-owner and director of brewing. Pics of the old days when the Cottonwood Brewery was located across the street from where the Holmes Convocation Center is located today. Andy Mason, co-owner and director of brewing at Lost Province Brewing Co., and Kinney Baughman, brew manager at the former Cottonwood Brewery in Boone, hold the old and new recipes to Black Bear Stout. The brewery operation at Lost Province Brewing Co. The tap at The Lost Province Brewing Co.